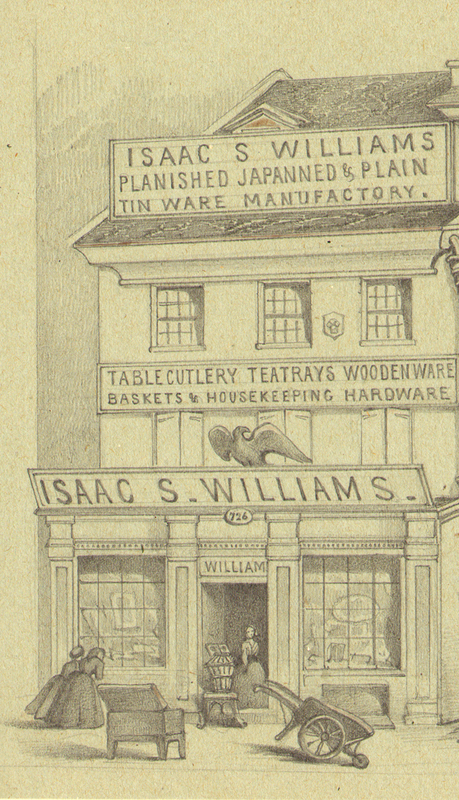 Colonial-era hardware merchants advertised japanned tinware, and the term lingered in usage to describe all manner of varnished and painted items. Common ground colors on tinware included black, red, green, yellow, blue, and white paint over, or in place of, a varnish. Bright oil paints were used to “flower,” or enhance, japanned items, like the leafy designs and borders on these objects. Basket, attributed to the Harvey Filley tinshop, Philadelphia, Pennsylvania, 1830-60. 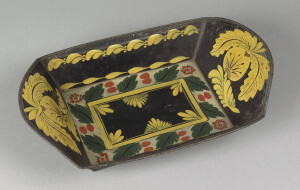 This basket, intended to hold bread, and the flat eight-sided tray are both attributed by their painted designs to Philadelphia tinshops of the 1800s. 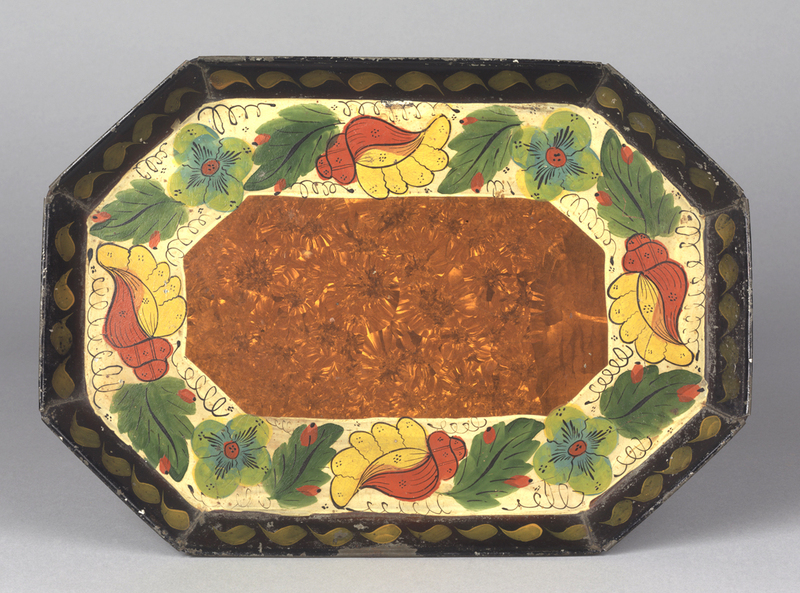 The tray’s sparkly orange center was created by placing acid on the bright tin, rinsing, and then applying coats of amber-color varnish. 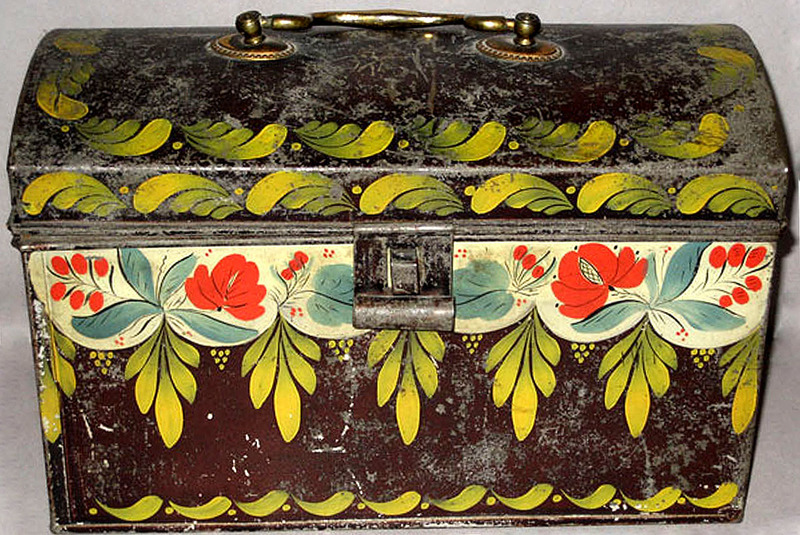 The “crystallizing” technique was patented by 1817 in England; American tinsmiths in the Mid-Atlantic region particularly favored the vibrant decoration. Tray, attributed to the Frederick Zeitz tinshop, Philadelphia, Pennsylvania, dated 1874. Trunks or handled boxes like these two were practical items for storing papers, writing materials, small objects, and even food. It is not a coincidence that modern lunch boxes look similar. Trunk, probably made in Connecticut or Philadelphia, Pennsyvlania, 1800-50. 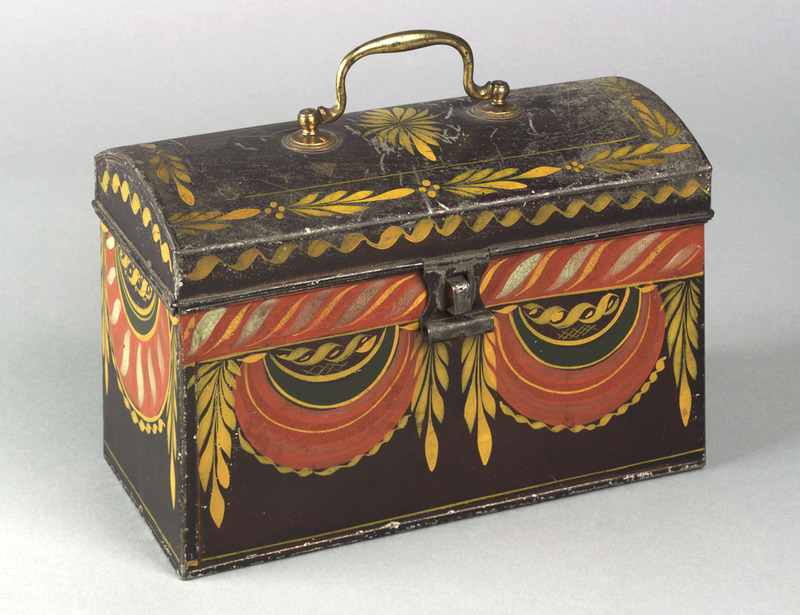 Trunk, attributed to tinshops in the area of Berlin, Connecticut, 1815-50. The lower trunk is attributed to an area near Berlin, Connecticut where tinware was painted with very similar alternating “candy-stripe” borders above the swags. Most early American tinware is not signed by the makers and decorators. Templates for cutting and piecing tinware objects were somewhat standardized, so identifying individual work by patterns is not always fruitful. 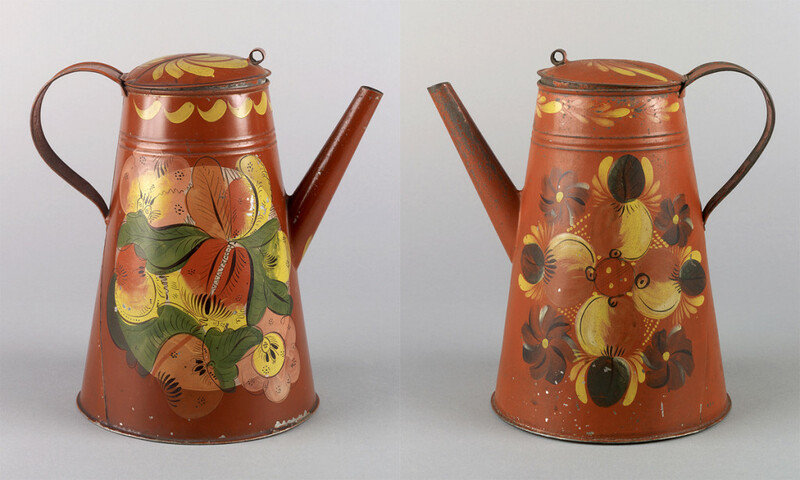 For example, both of these red coffeepots share similar construction features and size. Fortunately, because of their painted designs—one with large circular floral ornament and scrolling calligraphic lines and the other diamond-shape and geometric —they can be attributed to known workshops in Philadelphia (left) and Greenville, New York (right). Although a trained decorative painter might remain indefinitely with one tinshop, others traveled and relocated, carrying with them skills and favorite motifs. Peddlers traversing the countryside also carried tinware to distant rural customers; thus, identifying a specific decorator or shop can be challenging. Detail of base and Coffee pot, attributed to the Harvey Filley tinshop, Philadelphia, Pennsylvania, 1840-60. 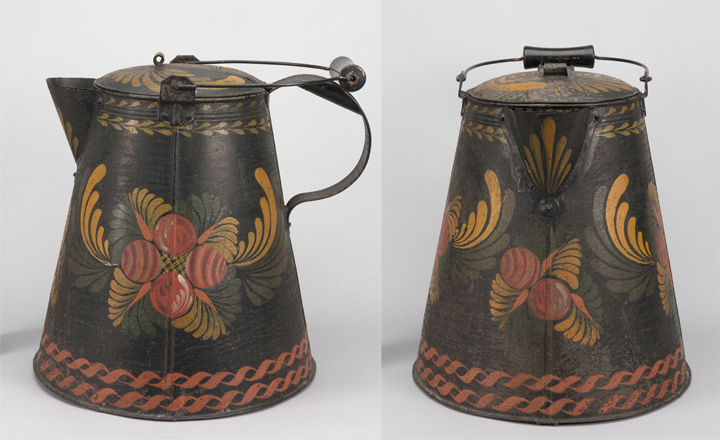 The black coffeepot (above) with distinctive blue, green, and yellow floral sprays is linked to a group of similar wares from a tinshop in Philadelphia. Cautious scrutiny of the black ground, black spiral lines among the flowers, and the yellow linear borders indicates that the object was later repainted. This is an example of old tinware being “refreshed” in the 1900s. Coffee boiler or coffee pot, made in the United States, 1830-60. This large coffee boiler is constructed in the manner of early American tinware. The quality of the painting for the red fruit, palm-like leaves, and borders suggests that it was possibly decorated later. The practice of redecorating tinware is not uncommon, particularly when paint or varnish becomes worn. The size of this pot indicates it might have held hot water, but evidence of caffeine was discovered on the interior by our conservators. This impressive pot must have been used to keep coffee warm for a group of people, perhaps in a boardinghouse or for a work crew. James E. Taylor, Market South Side, East of Eighth Street, Philadelphia, Pennsylvania, dated 1861. Joseph Downs Collection of Manuscripts and Printed Ephemera, Winterthur Library. This image is a detail from a larger drawing that captures a Philadelphia street scene in 1861, just about the time of the American Civil War. The artist depicts two women peering into the window display (left) for a tinsmith’s substanial shop. Behind the storefront, possibly upstairs, other women might be working alongside men as decorative painters to “flower” fancy tinware with appealing motifs.